NAMC | NORTH AMERICAN MUSCLE CARS, INC.
North American Muscle Cars, Inc. is a very diversified company. Not only are we known as professional mechanics with 20 years of experience in vehicle restoration, we are also eBay Power Sellers and Registered eBay Trading Assistants for auction style listings and monthly roll over on-line sales. Our eBay member name is "NAMCmopar" and this link will take you to our active listings. For many years NAMCmopar has been selling on eBay to a worldwide market with great success. We have included a few amazing eBay stories below. Selling on-line has everything to do with presentation, respectability and accountability. We work hard for all our buyers and sellers. NAMCmopar processes electronic payments via PayPal, Visa and Master Card to make it easy for the buyer. We have nearly 500 active items for sale in our electronic store daily and boast over 1900 positive feedback comments. We offer our services and experience as sales representatives to others so they too can turn clutter into cash. How? Anyone can sell on eBay, but NAMCmopar has a successful system in place with a proven track record that brings confidence into the sale. Think about it. : Wouldn't you feel more secure buying from an established seller who has been acknowledged by eBay as a great seller rather than buying from someone with only eighty feeback to his two month sales record? We believe that NAMCmopar will get a higher sale price for your item than you would get if you signed yourself up as an eBay seller. Check out our success stories below and see how much more value we can get for your items. eBay Stories ~ Sometimes It Is Just Amazing! Originally this vintage aluminum fuel tank sold to our buyer in England for $160 but it was in need of restoration. NAMC was able to offer professional fuel tank restoration services to re-work the original contours and re-spray the correct Yamaha yellow paint as an additional transaction. NAMC also supplied replacement decals sourced from this original tank before they were removed. Graphics were traced by hand, digitized in-house and refined by computer for output as vector based, two color, custom installed decals. A heavy top coat of clear protects the decals from further scratches. Our recreated 100, 125, 175 decal packages are for sale here & across the pond! This Challenger was restored by NAMC and sold on eBay. It traveled to Pennsylvania by an indepentent hauling company. This HEMI engine block sold on eBay for an amazing amount of money! 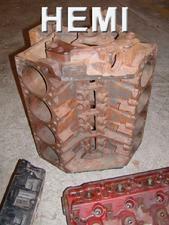 NAMCmopar listed this unstamped, cracked in cylinder 2, original 1971 426 HEMI engine block as an eBay 7 day auction item. We knew that this item was going to require a certain kind of buyer. This is what eBay listings are all about. Anyone can buy anything at any time on eBay - AND THEY DO! Our auction had a $500 starting bid w/ a $4500 reserve. Like many auction items on eBay, we saw some real interest in this item as soon as it was listed. We answered many questions from all over the world, posted detailed photos and presented this item to the best of our abilities. The reserve bid was met and then the serious players pushed hard to out bid each other. Our office was in an uproar watching this item go! Wouldn't you hoot 'n holler when the players are bumping up the price by $1000 with each bid? It was through eBay that we met this customer, Richard, when he purchased (highlighted in red) a pair of original 1972-74 Dodge Challenger Rallye Fender Gills from NAMCmopar for his project. He was very pleased with our on-line services and so impressed with our company description that he travelled from Seattle to meet us. Within two weeks Richard loaded up his project and delivered it to NAMC for full restoration. You can view Richard's Challenger in our photo page. He and his car now live in Florida where he continues to tell everyone about "those great guys at North American Muscle Cars in Portland Oregon" Thanks Richard!